Muinteoirí Una Ní Choileáin agus Brian McNicholls ag éisteacht leis na daltaí ón naoínáin mhóra sa Ghaelscoil agus iad ag canadh le Pat an Hata sa leabharlann inné. Chun Seachtain na Gaeilge a cheiliúradh an bhliain seo, bhí an-áthas orainn fáilte a chur chuig an seanchaí cáiliula Pat Speight, nó ‘Pat an Hata’ mar a dtugtar air. Tháinig Pat ar chuairt chugainn ó Chorcaigh agus chaith sé an maidin linn ag insint scéalta. 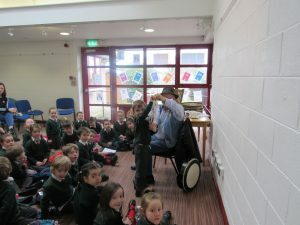 Idir na ceithre seisiún a bhí ar súil, tháinig céad agus a h-ocht déag daltaí chugainn ó nGaelscoil an t-Aonaigh, ón naoinán agus náoinán mhóra go dtí ranga h-aon agus ranga dó. Is maith le gach duine seanchaí maith agus ba léir go raibh Pat ag dul i bhfeidhm ar na bpáistí. 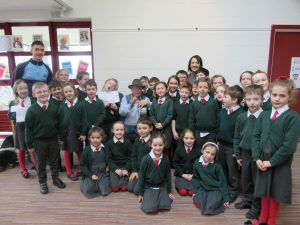 Seachas na scéalta greannmhar, déarfa go raibh sort draíocht ann freisin agus muid ag féachaint ar Pat agus na cleasanna cliste a bhí ar súil aige. Nuair a bhain sé bodhrán as a mbosca chríochnaigh an chuairt leis na daltaí ag canadh dó. Bhí siadsan sár – mhaith, mar is gnáth do dhaltaí on Gaelscoil, agus bhaineamar alán taitneamh as an maidin. 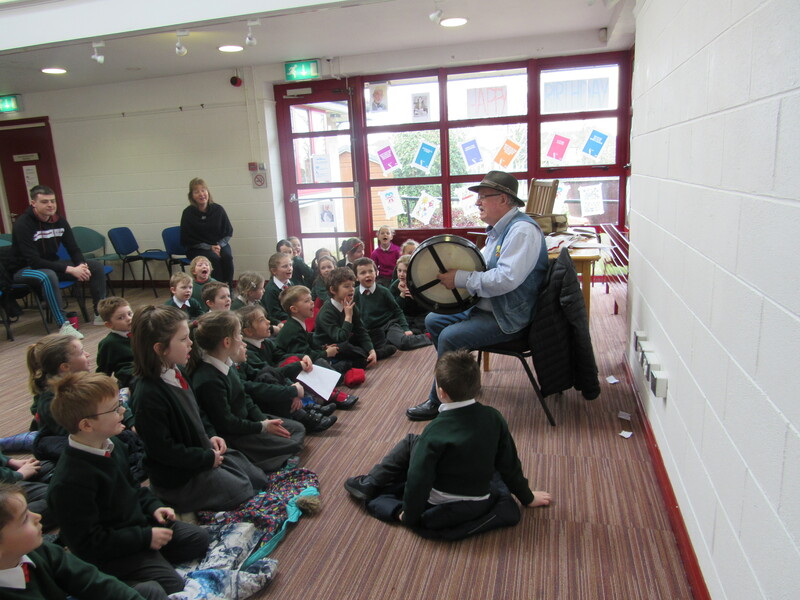 To celebrate Seachtain na Gaeilge this year we were delighted to welcome to Nenagh library the well known storyteller, Pat Speight or ‘Pat an Hata’ as he is known. Pat visited us from Cork and spent the morning with us telling stories. Between the four sessions we had 118 pupils come to us from Nenagh Gaelscoil, from junior and senior infants to first and second classes. Everyone loves a good storyteller and it was obvious that Pat was impressing the children. Apart from the funny tales you could say there was also a little magic present as we watched Pat perform several clever tricks for us. 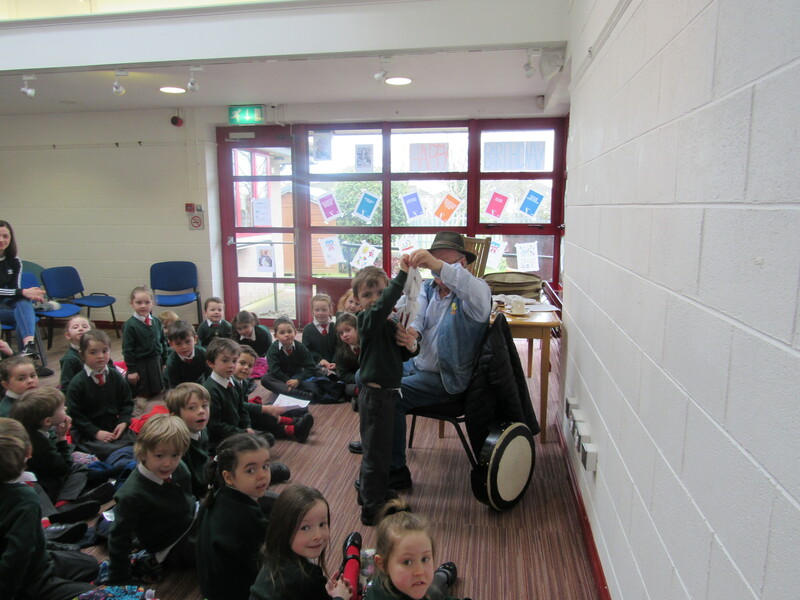 When he produced his bodhrán from a box his visit ended with the pupils joining him in a ‘sing song.’ They were excellent, as is usual with the pupils from the Gaelscoil, and everyone really enjoyed the morning. 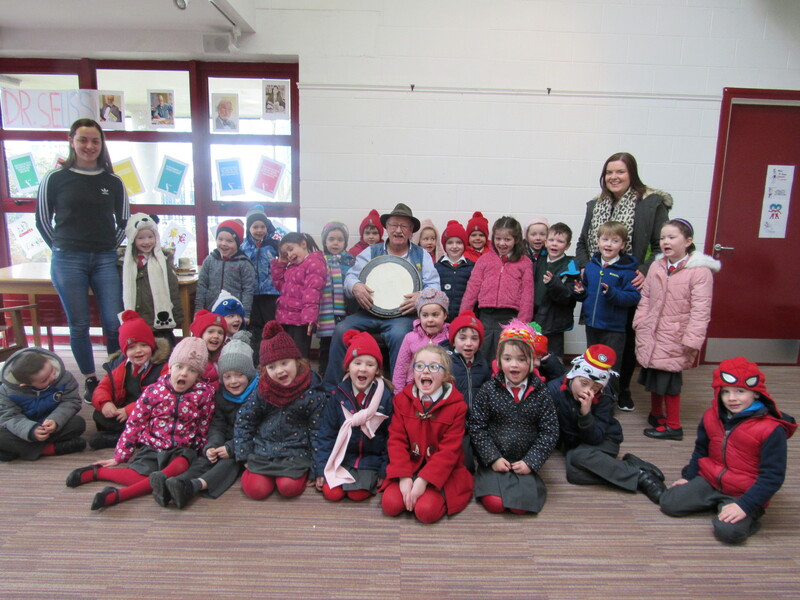 Dalta ó Gaelscoil an t-Aonaigh ag tabhairt cabhair do ‘Pat an Hata’ agus é ag taispeánt cleas cliste don aos óga sa leabharlann De h-Aoine chun Seachtain na Gaeilge 2018 a chéiliúradh. Daltaí ó naoináin bheag sa Ghaelscoil leis a muinteoirí Aisling Hogan agus Zoe Grattan agus Pat an Hata.